The School of Agricultural Sciences is one of the most prestigious constituents of Glocal University and offers B.Sc. Agriculture programme of four years duration comprising of eight semesters. School of Agriculture Sciences performs a dynamic and innovative education programme to meet challenges in human resource development, vital and relevant research and effective extension services to cater the need of farmers. The admissions to the B.Sc. Agriculture are based on multi-stream entries and thus the students from biology, mathematics group besides those from agriculture also get an opportunity to join the undergraduate programme. The students coming from different streams are required to study the remedial courses apart from the basic supporting and the core courses. A holistic approach has been adopted in framing the curriculum for the B.Sc. Ag. degree programme keeping in view the recommendations of the IV Deans’ Committee constituted by the ICAR. While preparing the course-curriculum regional needs and infrastructure facilities available at the University have been taken into consideration. Experiential learning in important areas with professional bias has been added towards graduation requirement. The degree programme is well known for strong practical focus and professionalism. Intensive well thought course work (165-170) credits including practical crop production (PCP) and Rural Agriculture Work Experience (RAWE) fit to meet the requirement of the hour constitutes the pivotal components of the degree programmes in agriculture. The course curricula are upgraded continuously from time to time incorporating the emerging concepts and technologies. The school is pioneer in starting PCP course for its first batch. 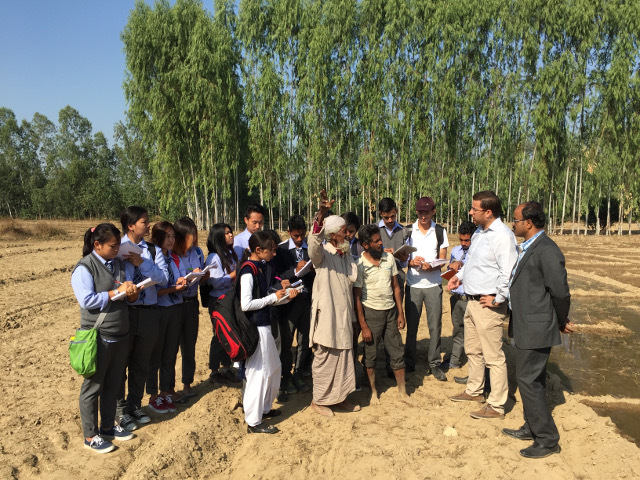 Practical Crop Production (PCP) provides the unique model for practical training in crop production and has been designed based on Agricultural Universities of the country. The School of Agriculture Sciences boasts for having modern physical amenities comprising classrooms, well equipped laboratories, a conference hall, ARIS cell, central analytical laboratory and a mini auditorium. The laboratories are equipped with modern equipment and instruments to facilitate the teaching and basic and applied research. To meet the need of advance research the School has developed specialized laboratories namely bio control, IPM, micronutrients, video production etc. The School enjoys a group of well trained, experienced and dedicated faculty who are nurturing the future of students vis-à-vis country. The contributions of the faculty members in academics, research and extension is well recognised nationally and internationally. According to one study, it is estimated that the annual requirement for agriculture professionals by 2020 would be around 65,000. Considering the present supply, there would be a shortage of about 30,000 professionals, thus giving a clear indication of a bright future ahead for agriculture professionals. Upon graduation or post-graduation in agriculture, there are ample opportunities in teaching, research and transfer of technology areas in ICAR, State Agricultural Universities, State Departments of Agriculture and Animal Husbandry and NGOs. The Union Public Service Commission (UPSC) conducts an annual competitive examination for recruitment in the Indian Forest Services, for which one of the educational qualifications required is Bachelor’s degree in Agriculture/Forestry. Any government job that specifies graduation as the required qualification like civil services, defense services, banks etc., the Ag BSc graduates can equally apply like any other graduates. Moreover, there are large number of local, national and international private business organizations, manufactures and NGOs where agriculture professionals can find decent employment. Software companies are also looking for domain experts in agriculture industry to plan, design and implement different software solutions targeting the agriculture sector. Government of India is encouraging to start business ventures in agriculture sector with lot of schemes, subsidies, incentives and financial support. Therefore, BSc Agriculture offers a wide scope particularly in India where half the workforce is living on agriculture. 2. After completing BSc Agriculture, continuing with higher agricultural education is one of the career options. 4. Study abroad option is also available where lot of foreign universities admits Indian BSc Agriculture/ Forestry graduates with scholarships (Commonwealth Scholarship, Erasmus Mundus etc). 7. There are large number of universities/institutions like IIM-A and IIM-L, where MBA with specialization in Agri related business is offered. 11. 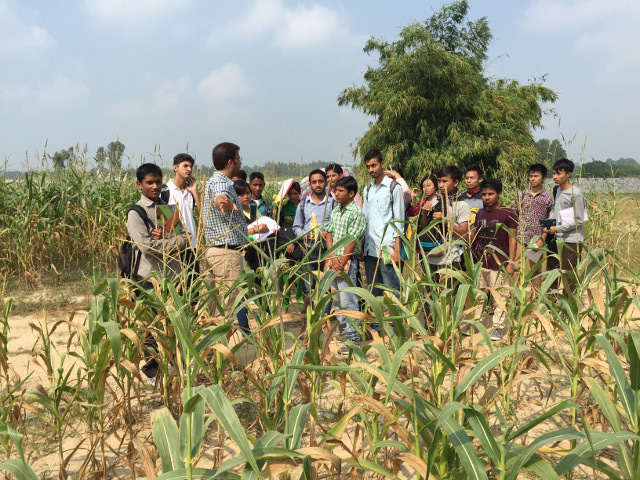 Many reputed companies visit our universities for recruiting BSc Agriculture students under campus placement program. 13. Jobs like Agriculture Development Officer (ADO), Class-I (Gazetted), Agriculture Extension Officer, Range Forest Officer, District Horticulture Officer (D.H.O. Grade-I), Superintendent-Govt Garden, District Cane Officer, Assistant Conservator regularly recruited by the respective state governments. 15. Agriculture/Forestry Graduate Trainee in IFFCO (Indian Farmers Fertilizer Cooperative Limited, A Multistate Co-operative Society). 17. Field Officers, Rural Development Officers, Junior Associates and Junior Agricultural Associates, Agricultural and Probationary Officers are recruited by different public sector and private banks of India. 19. For those whose passion is teaching, there are plenty of opportunities to make career in teaching at school, college and university level. 21. Agricultural Research Scientist (ARS) and Research Fellow posts are available with many government and private organizations. 23. There are number of private organizations that recruit Agriculture graduates on regular basis. 25. No industry is best suited for becoming an entrepreneur than the agriculture /Forestry sector. If your dream is to setup your own business to become an employment giver rather than an employment seeker, there are number of opportunities and promotional schemes from government to establish your own business in the agriculture/Forestry related industry. 27. When your passion is writing and reporting, then Agricultural Journalism is the best choice for you. 14. IFFCO Kisan Sanchar Ltd.
18. Savannah Sesds Pvt. Ltd. The mission of the School of Agricultural Sciences is to improve the quality of life of people, especially the rural masses dependent upon agriculture, through quality human resource development for efficient, effective and gainful utilization of productive resources, leading to knowledge led agrarian transformation and sustainable development of agriculture for addressing food security, nutritional adequacy, employment opportunity and eco-environment concerns. School of Agricultural Sciences offer undergraduate programme viz., B.Sc Agriculture with maximum intake of 60 students in each course and has linkages in academic programmes with other School of Science & Technology, School of Business & Commerce, School of Life and Allied Health Sciences. The School of Agricultural Sciences has special features viz., student Advisory System, Regular upgradation of courses curricula, IV Dean’s committee recommendation of ICAR Govt. of India for revised undergraduate programme for the course and curriculum have been implemented. 200 – 210 net instructional days of teaching, course work of 165-170 credit hours in each undergraduate programme, personality development through co-curricular and extracurricular activities, practical training through Practical Corp Production (PCP), earn while you learn programme, work programme and Rural Agricultural Work Experience (RAWE). RAWE is an innovative feature of B.Sc Agriculture programme which exposes students to real farming situations and hands on training. This also emphasizes application of technology learnt from improving agricultural production through interventions of Plant Health Clinic, Industrial Attachment, Village attachment and Field Visits. The School of Agricultural Sciences has excellence in Education, Research and Extension through contributions of its illustrious, well experienced faculty of international repute with modern facilities viz., smart class rooms, labs, educational Technology Cell, Conference Room, central Library with online facilities Hostels with modern amenities, Gymnasium and University Stadium, central Computing Facilities and Forum for Personality Development.